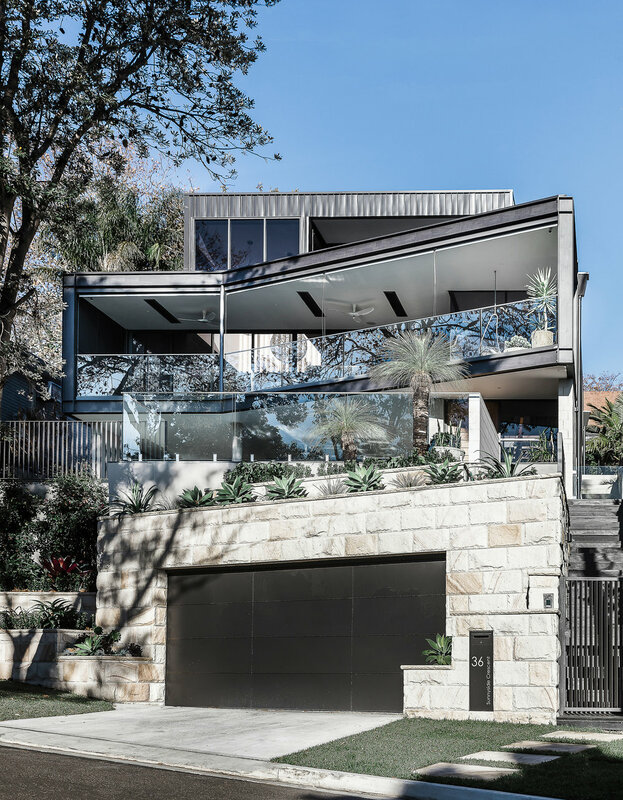 This home on the north facing part of Castlecrag was designed as a family home. It was designed to respond to the steeply sloping site and maximize the opportunity for views and northern sun. The main living area is located on a mid level with large north facing covered balcony, with district views. The angled facade which responds to the street alignment was designed with a cantilevered form with steel framed detailing. The alfresco area overlooks the pool and incorporates integrated retractable sun shading louvers. An integrated indoor outdoor is included on the lower floor providing an entertainment area adjacent the pool. The design also includes lift access from the basement level to the upper levels. The main bedroom suite and study area overlooking the living room is located on the upper level. The form here is differentiated from the lower floors being setback and metal clad. The interior features timber blade elements and batten ceiling.